Boxee, the media center application that gathers together multiple streaming sources into a single interface, received a lot of attention a few months ago. And it did so because a good number of computer and Apple TV users wanted to watch Hulu.com’s streaming television programs without the bother of launching a web browser. Weeks of cat-and-mouse games ensued with Hulu cutting Boxee’s access and Boxee’s crew finding ways around Hulu’s restrictions. But Boxee’s completely alive on the Apple TV (where Hulu Desktop does you no good) and far from dead on the desktop. Hulu continues to work within Boxee in both cases. But the people behind Boxee understand that it’s about more than Hulu. They remain committed to the idea of a single application for access to not only the media on your computer’s hard drive and those computers on your local network, but also as much of the world’s streaming media as can be made to work with the application. To help move things along, Boxee has hosted a couple of Dev Challenge events to encourage developers to write applications for Boxee (complete with prizes, yet). These Challenges and the work done internally have led to some interesting additions to Boxee. For example, you can preview and purchase music from Aimee Street, a source for music from independent artists that features a community-based pricing scheme (less popular tracks cost less and increase in price—up to 98 cents—as they are downloaded more often). There are more technology video channels available now, including CNET TV, Revision3, TEDTalks, and TWiT.TV. If you’re interested in watching others be active while you sit on the couch, Boxee offers some sports programming as well. This includes NBA, which features clips from various basketball broadcasts; Sports Illustrated (which may one day show something other than swimsuit models), and MLB.TV Premium, allowing those with a subscription to that service to watch baseball games within Boxee. 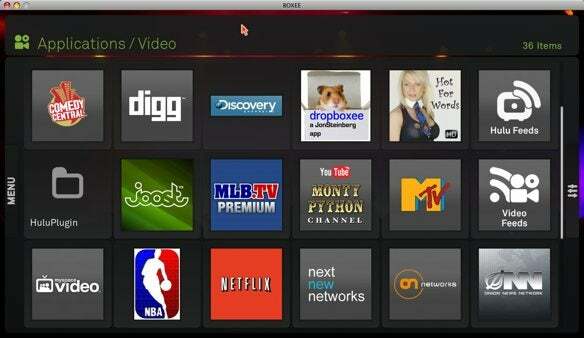 A selection of Boxee's many video sources. For those who enjoy classically cheesy movies, shorts, and cartoons, or time-honored silent movies from the likes of Charlie Chaplin and Buster Keaton, the Public Torrents option is worth exploring. Boxee has rTorrent built in, which allows it to download videos that are in the public domain. You can download a lot of classic content via Boxee. And if you like looking at pictures on your computer screen or TV, there remain a lot of sources including Facebook, Flickr, and Picasa. Apple has recently updated the Apple TV software to version 2.4. Installing that update to an Apple TV that has been lightly hacked to support Boxee wipes out those hacks. Fortunately, Boxee, XBMC, and all the other enhancements that come with ATV USB-Creator can be reinstalled following the steps I outlined late last year. If you have an Apple TV and are feeling constrained or are interested in easily accessing a wide variety of media within a single application, Boxee’s still worth your while.